COLLINGWOOD has put a torrid week behind it, grinding out a 15-point win over Gold Coast at a wet Metricon Stadium on Saturday night. While the 15.13 (103) to 13.10 (88) victory eases the pressure on Nathan Buckley – at least for a week – it does no favours for out-of-contract Suns coach Rodney Eade. Gold Coast had to play the second half with just 20 fit players after losing co-captain Steven May (hamstring) in the first quarter and midfielder Jarryd Lyons (ankle) in the second. The Suns were gutsy but the injuries shouldn't take any shine off the Magpies, who snapped a four-game losing streak. With the ground deluged by rain on two occasions the skills weren't always the best, but both teams cranked the pressure up in an entertaining contest. Buckley cracked a cheeky smile in his post-game press conference, musing that it was always better to win. "We were able to finish pretty strong, benefited by the fact they had a couple out - obviously their skipper and a bloke who's been playing pretty well through the midfield," Buckley said. "So the footy gods were smiling on us tonight and we were able to take advantage of it in the last quarter." In a see-sawing match, Ben Ainsworth's goal midway through the final term reduced the margin to three points, but back-to-back goals to Josh Thomas and Ben Reid gave the Magpies the breathing space they needed. The Pies midfield worked tirelessly and eventually ground their way on top. Adam Treloar and Steele Sidebottom (32 disposals apiece) got the most ball, but Taylor Adams (31 and two goals assists) was perhaps the most influential. 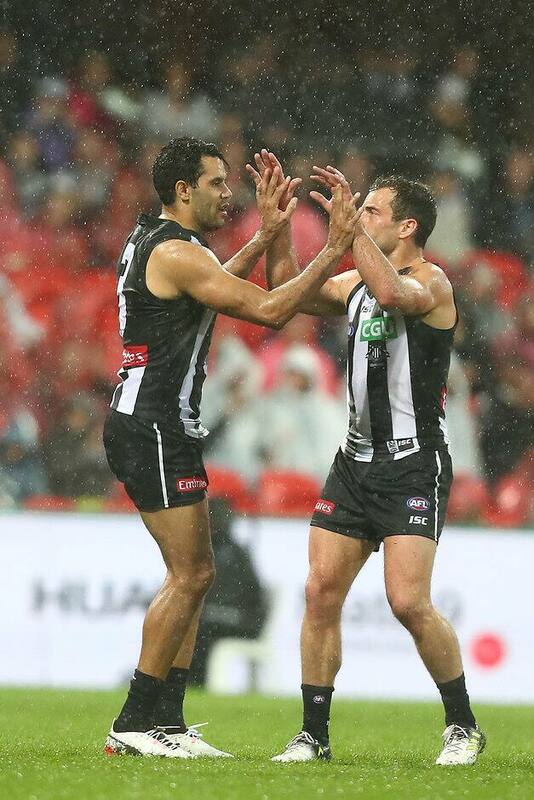 Daniel Wells had 18 disposals and two goals in his 250th game and was all class in the slippery conditions, while Reid (three goals) provided a good target in the forward 50 alongside Darcy Moore, Thomas and Alex Fasolo, who all kicked two apiece. It took the Pies until the final 10 minutes to get on top, but it was well earned as they dominated most key statistical areas, winning disposals (408-332), contested possessions (160-136) and inside 50s (63-44). For Gold Coast, Gary Ablett (41 and 11 clearances) was immense in his first game back from a hamstring injury, while Jack Martin (18 and two goals) was clever and David Swallow (25 disposals) his usual aggressive self. The loss leaves the Suns 6-10 and Eade under even more scrutiny after the club confirmed earlier in the week CEO Mark Evans was undergoing a review of the football department. Eade was rightfully proud of his players – their effort could not be questioned. "Overall, I thought our players were terrific, their courage," Eade said. "It (injuries) has an affect, I think. Two fold, you miss their talent is one thing, and then the cumulative load it puts on the other guys. "Towards the end of the third quarter we were fatigued and we made a couple of errors and I think the last quarter we just couldn't run that last five or six minutes." May's injury not only robbed them of a backline general, but forced a struggling Trent McKenzie off Fasolo – who kicked his two goals on him in the first term – over to Ben Reid. Gold Coast: May hobbled off late in the first quarter grabbing his right hamstring and did not return. The only saving grace – if you can call it that – was that it's the opposite leg to the one he strained against Carlton in round four. Eade expects him to miss two or three weeks though. Lyons rolled his ankle in the first term and tried to battle on, playing in the forward line, but was forced off just before the main break. Eade described the injury as bone bruising, that could see the former Crow sidelined for anywhere from two weeks to the rest of the season. Collingwood: Fasolo copped a knee from teammate Brodie Grundy in a first-quarter marking contest that looked to have ended his night. The Pies forward was doubled over clutching his ribs and assisted from the field by two trainers, but after missing the final few minutes of the quarter, came back on to start the second and played the game out. Collingwood will try and make it two wins in succession next Sunday afternoon when they host West Coast at Etihad Stadium, while the Suns travel north to Cairns to play the Western Bulldogs at Cazaly's Stadium.